Where God is evidenced. Where my soul is anchored. Where my heart is filled. Even though I had yet to fully process through it, or barely even recognize it, seeing Jesus in small moments (that somehow weren’t small at all) began before I even left the Atlanta airport to head to Guatemala City. And I meant every word of it. I had just been sitting at the window near my gate (caramel latte from Caribou in hand) as the sun came up, spending some time in prayer, and specifically asking for help to be fully present in each encounter I was given. But then I switched seats because I knew my friends and travel companions would be arriving from their respective flights soon. I was texting, facebook messaging, and tweeting to keep track of of the rest of the team leaving from Houston, and I was looking forward to the moment when we would all be together in just a few short hours. He approached me in a moment when my eyes were still glued to the screen … distracted and anything but fully present. A Guatemalan himself, he started talking about all the gifts he was taking back to his family that were sure to be under-appreciated. Truthfully, I have no idea why. I was only halfway paying attention at that point, and it took a couple of minutes for me to recognize that my prayer for being fully present in every encounter was being answered far sooner than I had anticipated. So as I put my phone down (because those messages and conversations could wait…), the conversation wrapped itself around to why I was going to Guatemala. What would I be doing and where would I be staying? I told him that I was going on a mission trip with a team of about 20 people to spread the name and love of Jesus Christ and that we would be staying somewhere in Antigua (but I didn’t really know exactly where). We would be serving in various places around Antigua as well as in Guatemala City in the community around the garbage dump. He nodded and acknowledged that he knew the area and then began to explain how Guatemala City is divided into several different zones. I didn’t understand all of it, but it sounded interesting. I said that I appreciated his perspective and that I would love to travel further outside of the cities someday. But he wasn’t finished yet. And then he ended the conversation and walked away. I’m not sure what this man’s name was and I’m not sure if he knew Jesus personally (though I got the impression that he did not, which made his observation all the more fascinating), but that’s not a conversation I will soon forget. And I can’t help but pray that, by God’s grace, I would live Jesus every other day of the year. Not just on Holidays. Not just on Sundays. This entry was posted in Travels & Outings and tagged #serveguate, antigua guatemala, Guatemala, Guatemala City, international missions, Jesus, Mission trip, missions, prayer on November 5, 2013 by Emily Gallimore. I carried that message – that question – close to my heart for those 5 days in Guatemala as the Lord and I continued an ongoing conversation. And on the last day of ministry, as we arrived at the abuelo’s (grandpa’s) home for those of an older generation that needed care, but had mostly been abandoned by their families, while I still didn’t necessarily “feel” much different, I had a deep appreciation for the peace that came with simply knowing … that He was God, that I was there because He invited me to join Him there, and that He was enough. After painting the nails of some of the women at the home, I sat down with one of my teammates, Sara, who had struck up a conversation with two adorable ladies … one of whom was 96 and blind. She made sure to tell us that several times. Her name was Nina. And she was precious. Even with the language barrier, we managed to have a decent conversation that was filled with our limited Spanish vocabulary, the help of Google translate, many smiles and so. much. laughter. I think those ladies were quite amused by the way we pronounced our limited Spanish with southern accents! After more-or-less exhausting our conversation abilities, Sara moved across the outdoor hallway that surrounded a beautiful courtyard to visit with another gentleman and I moved from my spot on the floor to the empty chair right beside Nina. I hadn’t been there longer than about a minute when she reached for my hands and pulled them both closer to her, so she could rub my hands and arms. It was such a simple gesture on her part, but in a way I can’t quite explain was such a huge blessing for me. And that seemed so backwards. Because wasn’t I supposed to be there to bless and to serve her? Not the other way around? I couldn’t help but think this must of have been a small taste of how the disciples felt that night at the last supper when Jesus washed their feet. As if it wasn’t supposed to be that way. But it was supposed to be that way, and it was right. And so was this small moment with Nina. She expressed to one of our leaders how grateful she was that we were there … that we were taking the time to just sit with her, to just be with her. And in that moment, I knew with even more certainty that this trip back to Guatemala, one that was full of questions on my heart and full of moments that were tempting to view as small and insignificant (but somehow weren’t at all), wasn’t about me. It was about the Lord moving in and through me to do the work and have the encounters that He had prepared in advance. All He needed from me was obedience and trust. And this obedience, this walking out the Gospel in the small interactions that I have with those who cross my everyday path … some who I’ll almost definitely see again and others who I almost certainly will not? This is what this life is all about. Seeking Christ, following Him where He leads, and being fully present in each moment with each individual He places before us. And yes, sitting with Nina as she rubbed my hands was an incredibly small moment, but it was entering into her world, being present with her there, and loving her well. And that really wasn’t small at all. This is how we’re called to live. To enter into the mess and uncertainty of relationship. To do life with others. To sit with them where they are. So I held hands with a 96-year-old Abuela in Guatemala. And I know that we were both sitting in the presence of Jesus the whole time. This entry was posted in Travels & Outings and tagged #serveguate, Adventures in Missions, faith, Guatemala, Mission trip, missions, missions trip, obedience, short term missions, trust on October 31, 2013 by Emily Gallimore. I have so much to share with you about my time in Guatemala … and the more I process, the more I want to share! I wanted so badly to express some of what the Lord did in and through this trip last week, but I ended up sick promptly upon my return home and just didn’t have it in me to do much more than work and then plant myself on the couch before crashing for the night and pushing through the next day. Forming coherent thoughts that captured the trip or the Lord’s hand at work with any sort of justice seemed near impossible. My energy level has been slow to return, and I’m still processing, but I couldn’t let another day pass without entering into this space to say thank you. For praying, for encouraging, for supporting … both me and the team I was privileged to serve alongside. But really, how do you begin to express or explain something that you can’t quite even label or name yet? I know the Lord did something, and is still DOING something, in and through this trip and this heart He’s given me for Guatemala. But putting that something into words? Well, it’s challenging … almost as if it’s still partially veiled. As if I’m not even supposed to be able to put it into words just yet. As if there’s something still being formed. And while my eyes have been opened to it and I’ve been given a front row seat to it, I’m still watching the first act. There’s still some ground to cover before the characters fully develop or the plot begins to make some sense. But oh, I saw the Lord move on this trip. I never expected not to, but I also want to intentionally stop and take the time to say it, to praise Him for it, to acknowledge that those prayers I prayed, those requests that had been on my heart for weeks, if not months – that I asked you to pray along with me – He answered! Not necessarily how I would have expected. But He answered. And He so graciously honored the step I took in obedience and faith to go. Because that’s this God we serve! Before I left, I knew I needed to let go of the expectations I was bringing along, which in and of itself was hard since the last trip in February had been so powerful. And this trip was certain to be different. But I also knew that the door had been so obviously and creatively opened for me to go back that this trip needed to be all His. For whatever reason, He wanted me there. And even though that reason was unknown to me, there was freedom in knowing that I could follow Him back to Guatemala, be fully present in each moment, and trust Him to do the rest. But honestly? That is still not my default. And that was not easy. I didn’t want this trip to be about me, but at so many points, I found myself desperately seeking and searching for a reason, for an emotional connection, for an obvious and out-loud purpose for being back in this country that I have come to love so dearly. As a result, the Lord and I had an ongoing conversation – a sort of internal wrestling and crying out on my part and truth-filled, yet gentle and loving replies on His – for the majority of this trip. I wanted a reason. I wanted to understand my place and my purpose. And I wanted to not react so negatively to the uncertainty around and within me. I felt emotionally disconnected. The culture shock was gone this time, and as I walked around Antigua on the first day, everything seemed so familiar. Even the smell at the Guatemala City dump the next day didn’t overwhelm all of my senses in the same way as before. While part of that was okay, I didn’t expect to feel quite so detached. I watched as my team reacted to all of it as I had before, as I would have expected to react again. I watched the tears and the brokenness and the feelings of helplessness come over them, and I couldn’t help but think something was terribly wrong with me. How could I not react with the same level of emotion? How could I not feel more? I didn’t want to come across as uncaring or lacking in compassion … because that’s not what was going on, either … but nothing was coming out in the way of obvious emotion or reaction and it could not be forced. So I found myself getting quiet and still before the Lord. I found myself hanging around the edges of the group at times to process the lack of emotion and to continue this conversation with the only One who knew my heart and thoughts even better than I did. The only One who could really see and speak truth into what was going on inside of me. Even in the way I heard it, in the negative form, had to be Him. Because only He would know that’s what would best get my attention in that moment. Because I wasn’t acting like He was enough. I was so focused on figuring out why I was there that I was missing the part about just being obedient in following and being with Him, in His presence, in Guatemala. That’s all He ever asked. He never promised an obvious reason or that I would know another specific purpose … or that there would even BE another specific purpose. And no matter what story (or straight up lies!) my emotions tried to tell, I could rest in that. Knowing that following Him to the place where He leads is always the right place. Jesus was already in Guatemala. He didn’t need me this time any more than He needed me the first time, but He invited me to join Him there again. To join Him in doing the work, to be His hands and feet, to partner with ministries who had established and long-term relationships in their respective communities, to humbly enter into the lives of others – if only for a brief moment – to love and serve them well and to be fully present in each opportunity. And in that place, I saw Jesus move in blue paint, in blowing bubbles, in big brown eyes that held your gaze, in smiles and much laughter, and in holding hands. I saw Jesus in small moments that somehow weren’t small at all. Because He was and is enough. And those are the stories I will be sharing with you here over the next few weeks. Because those stories matter. Entering into the lives of others, even for the briefest of moments, makes a difference … to you AND to them. And the small moments that make up our everyday realities are never wasted when they are fully surrendered to Jesus. This entry was posted in Travels & Outings and tagged #serveguate, Adventures in Missions, antigua guatemala, faith, Guatemala, Guatemala City, Jesus, missions, missions trip, obedience, surrender on October 22, 2013 by Emily Gallimore. 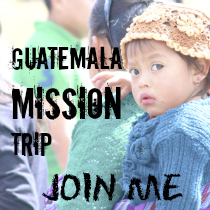 I’m Headed Back to Guatemala … in Less Than 12 Hours! That’s right. I’m headed back to Guatemala … and my flight leaves crazy early tomorrow morning. I’m so looking forward to seeing and hugging some friends from the last trip in February, reconnecting with some ministry contacts on the ground, and meeting and serving with this whole new team that the Lord has brought together (seriously, we have prayed HARD at several different points in the process for this specific team that the Lord has gathered!). But really, I’m mostly looking forward to just being in the Lord’s presence in Guatemala again and to joining Him where He’s already at work there. A few weeks ago, I began to feel incredibly uncertain about this trip. I could not for the life of me think of one good reason why I was going. I have no doubt it was the enemy attempting to get in the way. But the Lord has been so faithful to remind me in small and subtle ways … through His word, through prayer and communion with Him, through His people … of exactly why I’m going. As if I should ever expect anything less. When I left Guatemala in February, I knew I was leaving a piece of my heart and a piece of myself there. I fell in love with that place, and more importantly, with its people. I had no idea if I would ever have the opportunity to go back. But the impression on my heart the whole way home was that if God opened a door for me to go back, I needed to walk through it. I just had no idea that door would be flung so wide open so soon! So, I still don’t know the specifics of why I’m going to Guatemala for the next five days. But who needs that anyways? 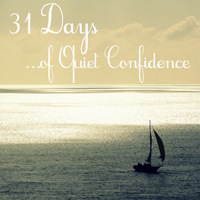 I know without a doubt this trip is a step taken in both obedience and faith. And that’s a pretty sweet and freeing place to be. I’m expecting God to work in big ways … in HIS ways … even if they aren’t big by my standards. And I’m expecting to serve Him according to HIS plans … even if they aren’t at all like my own. This trip is His, and I can’t wait to see how He furthers His kingdom in and through it. 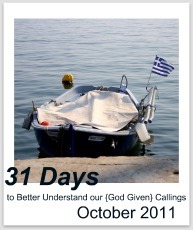 Would you join me in praying for this trip? and that the name of Jesus would be boldly proclaimed in all that we say and do! Thank you so much for partnering with us in this way. Prayer is so powerful and it truly means more than I can adequately express to know there are so many people lifting up this trip who are equipped with that sort of power! I am not planning to blog while in Guatemala, and internet access will definitely be limited, but if I’m able, I will post updates on twitter (@emily_gallimore) and/or instagram (@egallimore), and I will look forward to sharing more in this space once we return home. This entry was posted in Life and tagged Adventures in Missions, Guatemala, international missions, missions, missions trip, prayer, serving, travel, traveling on October 8, 2013 by Emily Gallimore. I’m Going Back to Guatemala! Want to Come? At the beginning of February, I traveled to Guatemala with an amazing team of strangers-turned-friends under the leadership of author Jeff Goins on a vision trip based on his book, Wrecked, that could only have been planned and orchestrated by God. Those few short days in Guatemala left me emptied of myself and forever changed. I came away with a deeper understanding of what it means to be a small part of God’s bigger story by simply being available and humbly learning from and loving on His people. Two months later, I’m still processing and learning what it means to live fully and love well in each moment while being confronted with a sort of uncomfortable tension that won’t let me sit complacently doing my own thing, fulfilling my own selfish desires, because more than anything my heart longs to live for the Lord and to serve where and how He leads. But even all of that seems rather unimportant. Because none of this is about me at all. It’s about Christ. It’s about His love for His people. It’s about His beautiful and glorious redemption. When I left Guatemala, I didn’t know if I would ever have the opportunity to go back. But not long after we returned, one of my new friends-who-feels-more-like-family, Alene, began to share that God was speaking to her about taking a team back to Guatemala. Specifically back to Guatemala City to serve with Potter’s House and in the community of Treasures surrounding the dump. So, I’m going back to Guatemala with her team October 9-13th, 2013!! Is God speaking to your heart to go and serve with us in Guatemala City? Find out more details and information HERE and HERE. This entry was posted in Life and tagged Guatemala, Guatemala City, international missions, missions, missions trip, redemption, serving, travel, traveling, Wrecked on April 5, 2013 by Emily Gallimore. I don’t know how to fully express all that still runs through my mind and heart as I recall and reflect on the time we spent in and around the Guatemala City dump. As our vans pulled into the vicinity of the dump on the morning of our second day in Guatemala, the first sense immediately affected was smell. But that would soon become of minor importance as we learned that 11,000 people – 6,500 of them children – live near and work in the dump each day. I couldn’t imagine a life where getting up in the morning and going to work meant looking through the trash, searching through each new heap left by the seemingly endless stream of dump trucks, in hopes of making dollars a day to provide the most basic needs for my family. The surrounding community calls those who live this reality “scavengers”, a term filled with negative and judgmental connotations, but Potter’s House – the ministry with which we partnered to serve that day – knows them as “treasures” because they, too, are human beings, God’s highest creation. Marlon is one of those treasures. We stood on a cliff overlooking the busy dump as this now 20-year-old with a 9-month-old baby of his own resolutely recounted through a translator from Potter’s House his story of a difficult and heartbreaking background filled with drugs, abuse, violence, life on the streets, and even a pact with the Devil. But then at some point in the middle of the story, beautiful and overwhelming redemption. Following his father’s tragic and violent death, Marlon began working in the dump at the age of 6 to provide for his mother and siblings. He ran away for a time during his teenage years, but came back to continue providing for his family and now openly and unashamedly speaks of the hope that can only be found in Jesus Christ. Marlon has a dream for a different life, a dream that includes preaching the message of hope and trust in Christ to a full stadium. Yet even from the difficult and dangerous life he currently leads as he continues to work in the dump for now, he still proclaims with boldness, directness, and assurance that this life is borrowed and Christ makes all things new. And in those moments, I caught another glimpse of the Lord’s compassion and love for His people. Seeing with His eyes. Feeling with His heart. Therefore if anyone is in Christ, he is a new creature; the old things passed away; behold, new things have come. This entry was posted in Travels & Outings and tagged Adventures in Missions, all things new, Guatemala, Guatemala City, Mission trip, missions, Potter's House, serving, travel, Wrecked on February 19, 2013 by Emily Gallimore. On that Sunday afternoon after attending church in Antigua, just prior to receiving the challenge to use $5 however the Lord would lead, we were sent out on our first ministry assignment: to spend an hour walking around the city (in pairs) and observing our surroundings while quietly praying that the Lord would allow us to see through His eyes. My partner and I headed to the crowded and colorful market – in many ways the center of the city and its culture. As a videographer great at both seeing and telling a story, he was completely in his element, but although I love the Charleston market and something about the Plaka district in Athens forever captured my soul, without my camera in hand, I was completely overstimulated and out of mine. Although honestly somewhat skeptical of the assignment at hand, I was genuinely seeking the Lord and at least halfway expecting Him to open my eyes to some profound theological truth or insight. Because that was the whole purpose, right? No pressure. But when we paused for a moment not long after entering the outskirts of the market, the Lord allowed me to watch a seemingly everyday sort of scene unfold in one of the clothing shops. Two women, a toddler, and a baby in a walker who appeared to be about 10 months old were all crowded into an incredibly small square space full of merchandise. The shop was a step up from the ground, so every time the baby walked close to the edge, one of the women (his mother, I presume) pulled him back, so he wouldn’t fall. Seeing with His compassionate eyes. Loving with His overwhelming heart. Longing for His Kingdom growth. Over and over again. He is the faithful Father. This entry was posted in Travels & Outings and tagged adoption, Adventures in Missions, child of god, children, Guatemala, Mission trip, missions, prayer, Wrecked on February 15, 2013 by Emily Gallimore. Hey! I'm Emily....I'm a beach loving, caramel latte drinking, flip-flop wearing, over-analyzing, 20-something follower of Christ. I'm captivated by old architecture, inspired by a good photograph, and enthralled by a great story. I'm grounded in Scripture and strive to "live a life worthy of the calling I have received."